This is a binary executable file debugging tools. Can be used for debugging the compiled binaries or third-party binary dynamic or static library file. This tool is used to modify, redirect function import. Can also be used to monitor function calls or Redefining Function. Will generate named “hello” executable file, run the “hello” will be displayed: Hello World! Open this tool in the tool to open “hello”, you will see hello called “/usr/lib/libSystem.B.dylib” in the “printf” function to display this text. When debugging software, sometimes want to know what the procedure “printf” to pass those parameters, or want to call your own “printf”. Will generate “print1.dylib” dynamic libraries. This example would call the system “printf” function, so we will own “printf” function named “print1″. In this tool to import “print1.dylib”. Modify “_printf” as “_print1″, select from “print1.dylib” import this function. Call Printf: format = Hello World! RS232 Monitor is software for communication with peripheral devices using RS-232 interface. RS232 Monitor allow to receive and transmit data through COM port. Configure any COM port properties (set DTR, RTS levels, CTS, DSR Sensitivity). Available data formats are: ASCII, HEX, BIN, DECIMAL and FLOAT (IEEE 754). 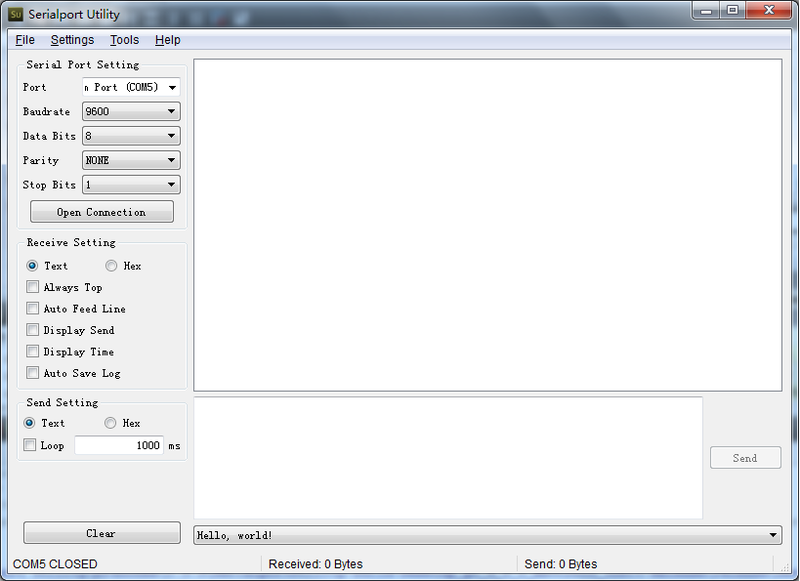 Additional possibility to send files, and transmit data periodically. Bug Tracker is a high-performance bug tracking, defect tracking, issue tracking tool for project managemnet during software development and software testing stage. The auto task assignment makes it easy for you to assign the bugs to the proper developer automatically and saves your time and money. You can use the powerful filter with AND, OR operator and wildcard to find your bugs quickly. The flexible right control helps you manange the users account, it also have predefined right template suitable for most cases. This bug tracking software supports flexible work flow that and enables you to reactive the bug that is already closed. It also offers feature reporting, print and automatic login. This bug tracking software support unlimited number of bugs with high performance. The trial version allows you to add 200 bugs/feature into one database. 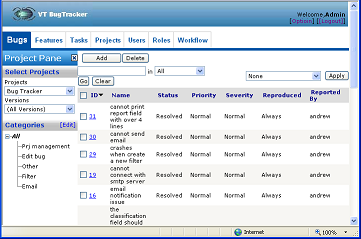 Bug Tracker Web based version is a flexible bug tracking, issue tracking tool for project management, this tool can help you to manage all the bugs, feature requests and tasks that are created during software development and software testing stage. – Bug tracking/Defect tracking – Task enables you to create new tasks and assign them individually to users – Quick search enables you to find your records fast and easily – Attach files to bug/features/tasks – Customizable columns – Auto task assignment makes it easy for you to assign the bugs to the proper developer automatically and saves your time and money. – You can use filters to find your bugs/features and task quickly. – Flexible right control helps you manage the users account, it also have predefined right template suitable for most cases. – Web bug tracking software supports flexible work flow that and enables you to customize the development process. – The trial version allows you to add 30 bugs/feature/tasks into one database. Null-modem cable is basically used for communication of two RS-232 “DTE” devices with each other. To create null-modem connection between the devices you need to use two computers or two serial ports of a single computer connected with null-modem cable. The both methods described above are expensive and difficult because of many reasons. The most reliable way to create null-modem connection is using of virtual serial ports emulated by virtual serial port driver and null-modem cable. Why do you need to emulate serial ports and null-modem connection? There are few main reasons to do it. Firstly, you dont need to have two computers connected with real null-modem cable. Secondly, theres no need in a single PC with several free serial ports and additional multi serial port devices which are expensive and bulky. To emulate null-modem connection Virtual Null Modem can be effectively used. The program emulates one or more couples of RS-232 serial ports connected via virtual null-modem cable. It is possible to create the unlimited couples of virtual serial ports on a single PC and connect them in any sequence using virtual null-modem cable. Usually you need to use virtual null-modem when you have two applications to be connected via serial ports. In contrast to ordinary connection you do not need any additional hardware (computers, physical serial ports, cables) to perform it. Virtual null-modem allows user emulate virtual null modem connection and run the two applications simultaneously on the same computer. Moreover, it is possible to emulate real-world situations by adding some errors to the data exchange which may occur during the physical null-modem connection. Owing to its features set Virtual Null Modem can sufficiently ease the work of software developers and testers occupied in the field of industrial automation. Furthermore, the program may also be useful in the reverse engineering as well as in educational needs. So go ahead and download FREE trial version now!